Use this DIY fruit and vegetable wash to get rid of most of the pesticide residues over half your plate. You can mix it up in less than 5 minutes and save money over the cost of commercial fruit and vegetable sprays. Nobody wants to eat poison. Even low levels of pesticides on fruits and vegetables can lead to health problems like infertility, digestive issues, liver toxicity, respiratory problems, skin rashes, and even cancer. There are hundreds of different pesticides approved for conventional agricultural use and about 20 approved for organic use. All produce however, may have in additional to pesticide residues, dirt, bacteria, or viruses. To minimize food contamination, most people wash their fruits and vegetables before preparing them for the table. This is best practices and you definitely want to keep doing it. But you might be wondering if simply washing lettuce under the cold water tap is enough to get the pesticide residues off. And what about the vitamins, flavonoids, and carotenoids that are in the fruits and vegetables. Will they be washed down the drain with the pesticides? This question becomes more important with recent National Food Guide updates. 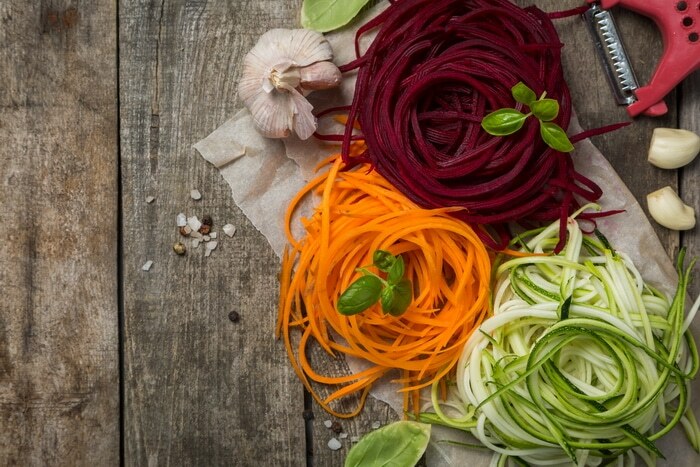 The new food guidelines recommend making half of all food consumption fruits and vegetables or “Half Your Plate”. With more fruits and vegetables on the menu, minimizing the health impacts of residual pesticides is crucial. First, wash fruits and vegetables under cold, running water. This will remove up to 80% of all residual pesticides, viruses, and bacteria. Once you’ve done the cold water rinse, spin out salad greens or other leafy vegetables. Removing excess water ensures that most of the residual pesticides are washed away. Second, for leafy vegetables, tender fruit, root vegetables, and soft fruit you can soak the vegetables in a pH altered cold, water bath for 5 to 15 minutes. This is especially useful for food that will be consumed raw. Further for thicker skinned fruits and vegetables, soaking in an alkaline or acidic solution can help break down the cells in order to remove some of these deeper pesticide poisons. Scientists in Thailand found that using a pH altered water soak for 5 to 15 minutes further reduced any remaining pesticides by up to 75%. This leaves only 3 to 5% of the original pesticide residues unchanged. Soak fruits and vegetables in cold water to which one of these food-safe acids have been added. Soak for 5 to 15 minutes for best results. Tender skinned berries might be damaged by longer soaking, so if you choose to soak tender berries like strawberries, blackberries, or raspberries, limit soaking time to 1 minute and do this just before serving. Vegetables soaked in an acidic soak should be rinsed in cold water in a colander, to remove any traces of soaking water, before serving raw. Just as with the acid soak, a soak in salt or baking soda breaks down residual pesticides and removes them from fruits and vegetables. You can use either an acidic soak OR a salt or soda soak. There is no advantage to doing both. Soak fruits and veggies for 5 to 15 minutes for best results. Rinse with clear, neutral water and drain to remove most pesticides. Many of the organo-phosphate pesticides are destroyed by heat. Cooking, boiling, steaming, and stir-frying removes pesticide residues by breaking the pesticide molecules apart. Cooking eliminates 85 to 90% of pesticide residues in food. So for fruits and vegetables that you are going to cook rather than eat raw, simply washing in cold, running water, followed by cooking can remove 95 to 98 percent of residual pesticides from fruits and veggies. The Thai study found that the high heat of stir-frying for 5 minutes removed 85% of pesticides while boiling in water for 5 minutes removed 95% of pesticides. Vegetables should be drained after boiling and the cooking water discarded. 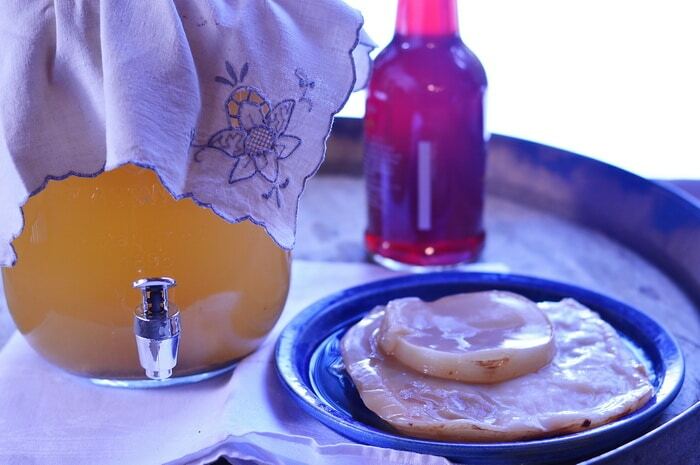 Fermenting fruits and vegetables by making wine or sauerkraut or Kvass or Kombucha destroys the pesticide molecules in fruits and vegetables rendering them harmless. Fermentation also makes flavonoids, polyphenols, and carotenoids more bioavailable to the body. Consider adding fermented foods to your daily food choices. Some fruits with a heavy, waxed or netted skin contain pesticides that are deeper than the peel of the vegetable. Washing with plain water doesn’t penetrate deeply below the surface of the fruit or vegetable. Using one of the soaks mentioned above works for large batches of produce. 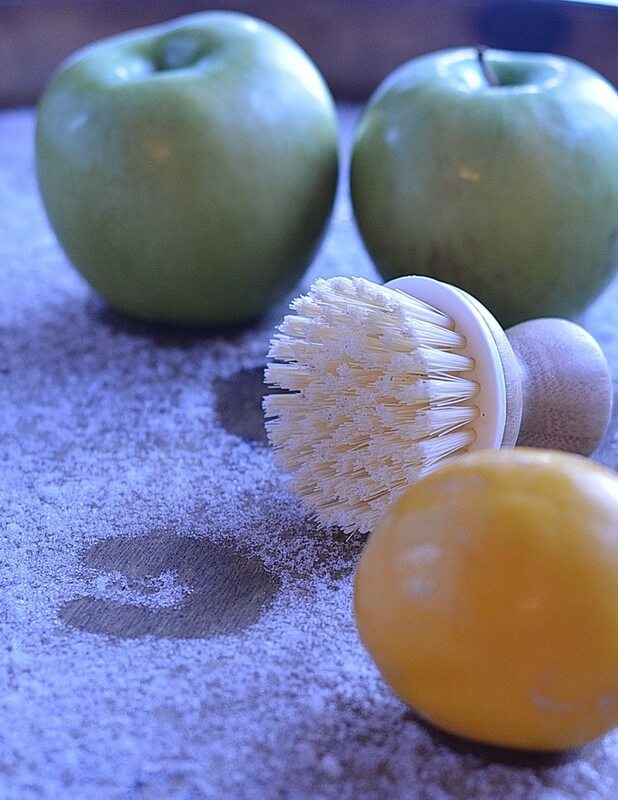 But when you only have one or two pieces to clean, this DIY Fruit and Vegetable Wash spray is very helpful. This is more effective than commercial products because it contains fewer chemicals. You can mix up a batch in 5 minutes or less. 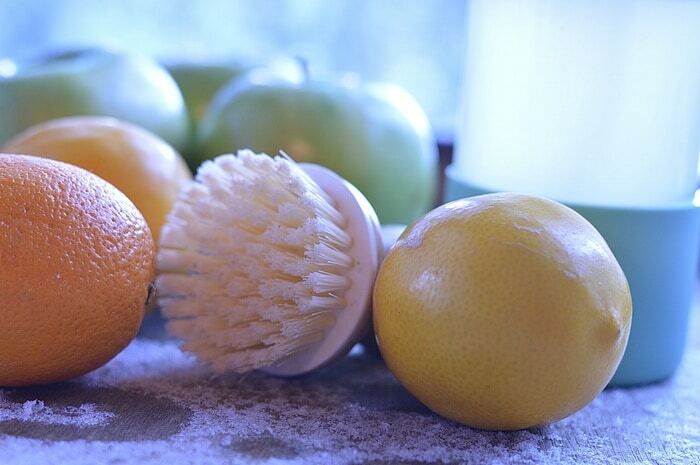 This fruit and vegetable wash is made with natural ingredients. Do not substitute castile soap for the dishwashing detergent. Acid and soap when mixed together form a thick curd that will be difficult to spritz from the spray nozzle. Using a natural, vegetable-origin detergent will not form a curd when citric acid is added. The lemon essential oil in this recipe contains high amounts of D-limonene, a monoterpene which is known to break down pesticides. 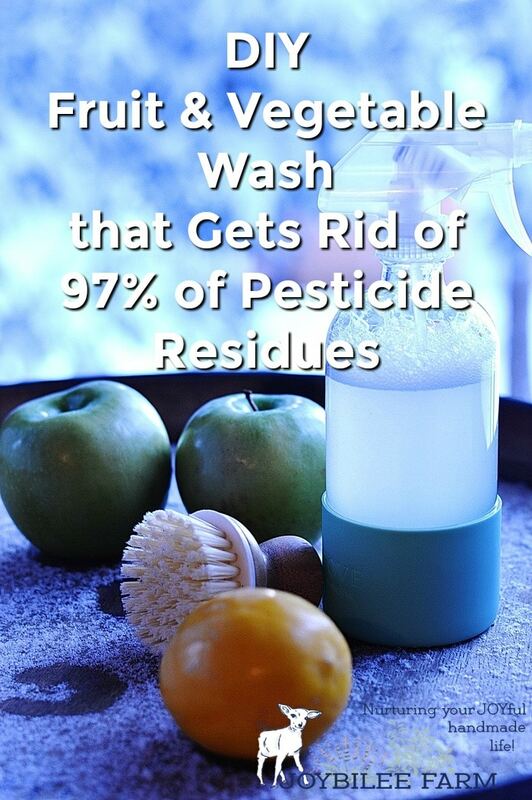 This natural wash will remove residual pesticides, bacteria, and viruses from fruits and vegetables. 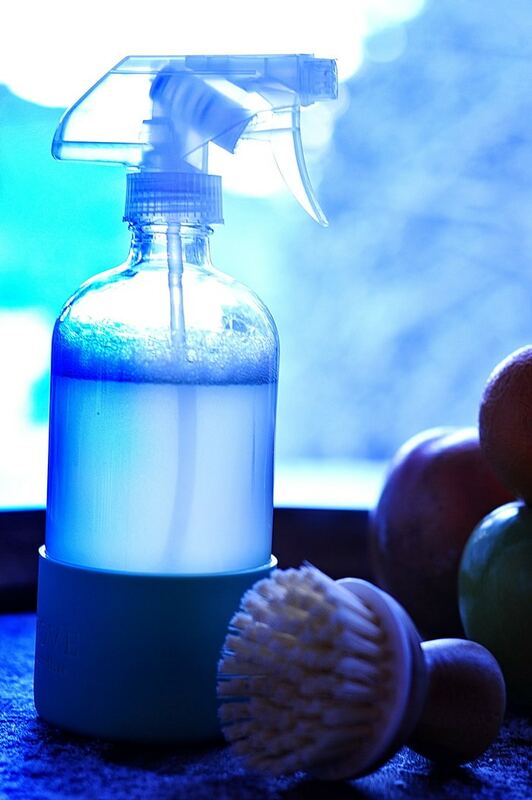 Add liquid detergent, essential oils, and citric acid to an amber glass bottle. Fill up the bottle with filtered water only to the shoulders of the bottle. Add spray cap. Prime the spray bottle by spraying into an empty sink. Contents are acidic so do not spray in eyes or on the skin. Rinse fruit or vegetables under cold, running water to remove 80% of any pesticide residues. 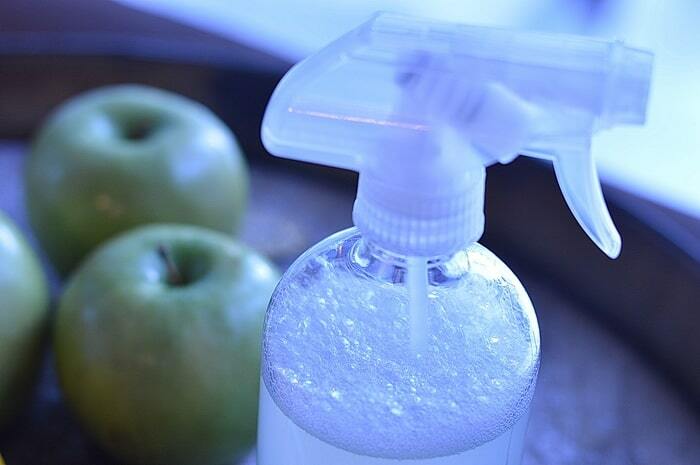 Use this spray on heavy skinned fruits and vegetables to break down wax coatings that prevent pesticide residues from being rinsed off with plain water. Spray fruit or vegetable. Allow this to sit on the fruit for 60 seconds. Rinse off. 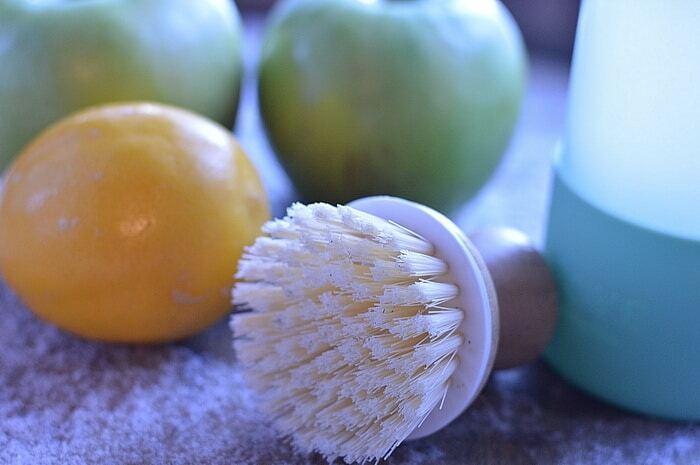 On rough-skinned fruits like melons or squash, use a vegetable brush to before rinsing to thoroughly clean the fruit. Some internet gurus suggest using a combination of baking soda and vinegar or baking soda and citric acid combined in a bottle as a vegetable wash. Don’t do it. That fizzy reaction that you get when you add vinegar to baking soda is the acid of the vinegar buffering the alkalinity of the baking soda. In short when the fizzing stops you have neither an acid nor a base. And it won’t be any more effective in cleaning up pesticide residues than plain cold water. (which is 80% effective, remember?) So you’ll be wasting both your money and your time. Avoid using a natural Liquid Castile Soap or any other liquid natural soap where the recipe calls for an acid like vinegar or citric acid. In hard water, acids and soap combine to make sticky soap curds. These lack the cleaning power of the soap. Plus they cause the soap to float on the surface of the bottle, creating a mess. Instead, if you are using an acid, like in the above recipe, use an eco-friendly detergent, which won’t form a soap curd when combined with the acid in hard water. While no home cleaning method is 100% effective at removing all pesticide residues from all fruits and vegetables, you do have many tools that will remove up to 98% of pesticide residues using just common and inexpensive pantry items like citric acid, vinegar, or baking soda. Go ahead and enjoy your fruits and vegetables on half your plate knowing that you can easily remove toxic pesticides from your plate using these simple steps. Getting toxic chemicals out of your home using simple cleaning solutions like this one can save you money and improve your family’s health. Find out more here.